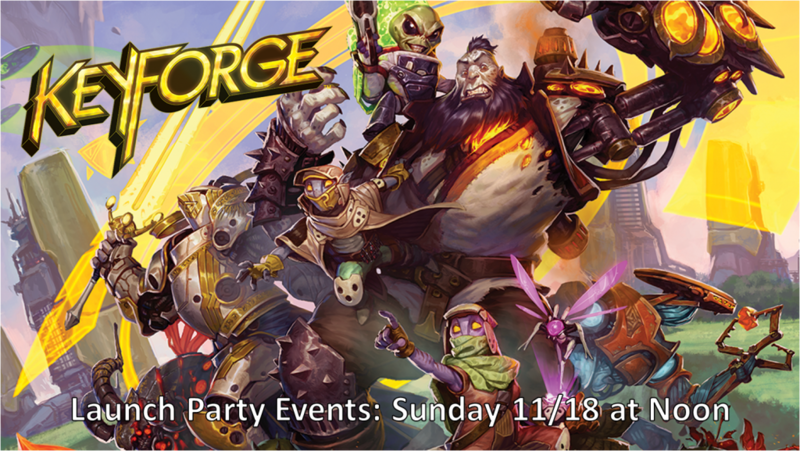 KeyForge officially releases on 11/15 and we’ll be having a launch party and tournament on Sunday 11/18 at BOTH stores to celebrate! Pair up with another attendee, open your starter decks, and play with the Quickstart rules in a Learn-to-Play game. Next, you’ll open your unique Archon decks and register them in the Call of the Master Vault. Finally, you and your fellow attendees will enjoy a quick, four-round Launch Party Tournament, using all four decks from your starter sets. Launch Party Activities are FREE (not including the cost of a starter set). Giveaways and prizes are available while supplies last. Everyone will receive a sealed Archon deck and participate in a tournament using only that deck. Total number of swiss rounds will be dependent on the number of participants. Cost of entry is $15 which includes a brand new sealed Archon deck. Prizes will be awarded based on the total number of participants.